Brick walls are as South African as "Boere wors and braai vleis", but can be costly and time-consuming to create and keep standing. Brick Crete provides the classic visual impact of a semi-face brick in an affordable product that is fast and easy to construct and has a virtually unlimited longevity. Brick Crete features rounded edges with chipped and pitted details that closely resemble real bricks. The pattern and texture is an excellent match for existing brick structures and creates a classic ambiance that complements the landscape. Brick Crete is base on a new concept that is visually and structurally an improvement on any other product in its class at a very competitive and affordable price. Duplex and homeowner associations choose Brick Crete to replace single course clay brick walls. Monthly fees allocated for fence maintenance will be substantially reduced or eliminated as a result of the maintenance-free Brick Crete and our other fences. 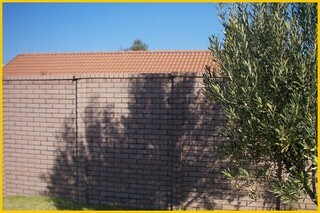 Pre cast walling is at 50% cost of normal brick walls.